Marketplace sellers are really interested in opening their own online stores to move their ecommerce business to the next level. If you are more than happy with your sales and want to open your e-store during this festive season, you’re in the right place. Shopify will help you do this. We have therefore compiled Amazon’s selling secrets via Shopify. Shopify has proved to be a user – friendly online shop platform. Shopify is an e – commerce website that aims to provide you with an online store to help you become a brand. With the development of importer applications such as CedCommerce’s The Amazon Importer App, it is convenient to update product details from markets to online stores. Importer apps provide a gateway for successful market – to – online interaction. It ensures that you can manually upgrade and edit product details which are simply not feasible. Without importers, it would be very difficult to import your product information from a marketplace like Amazon and put it in your online store at Shopify. Log in and install CedCommerce’s Amazon importer. Complete all Amazon importer onboarding steps. Registration – Please fill in the form to go ahead. Select a plan – CedCommerce provides different reasonable plans. Connect your Amazon Seller Panel – this is the combination process by connecting your Amazon Seller Panel with the Shop. Settings/Configuration – This step requires you to fill in your Shop, Amazon importer configuration and choose the type to be imported. You can select any of the following: all products or only active products to sync with your Amazon account. Product Edits & upload – You can modify and upload your product details after importing your products into the Amazon Importer App. Profiling – The creation of a profile is required. 2. Allows you to select products such as product attributes, operator and value that you wish to upload. Configuration – You need to fill in account information, store details and Amazon credentials in this step. The CedCommerce Amazon Importer App enhances your experience as an online seller and makes your journey beautiful and successful. WooCommerce Vs Shopify Dropshipping – Which One Suits You ? How to Start a Profitable Dropshipping Business from South Africa ? How to Build a Highly Converting Shopify Dropshipping Store ? How to Start Money Making Dropshipping Business From Australia ? Is Amazon Dropshipping Dead or Still a Profitable Business Model? 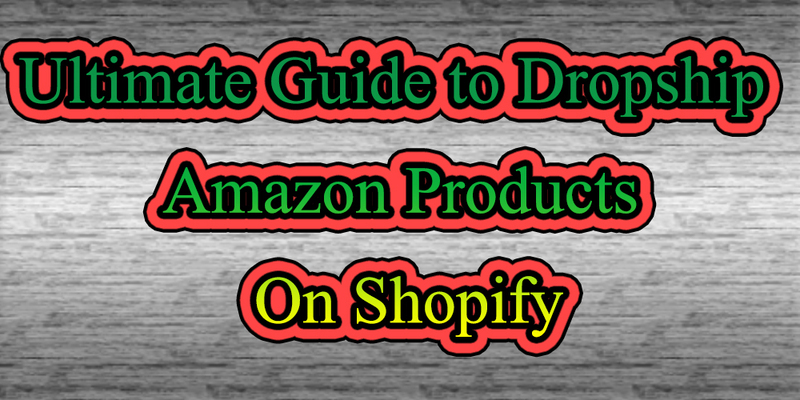 How to Earn More by Dropshipping from Aliexpress to Amazon? How to Find Private Label Dropshipping Suppliers and Products ? Ultimate aim of our community is to help beginners and intermediate to get passive income in dropship business. Stay update with us on trending products and latest technology in dropshipping by sharing your emaill address with us.